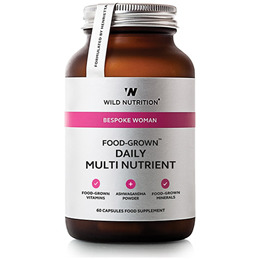 Wild Nutrition`s Food-Grown Daily Multi Nutrient has been expertly formulated to reflect the change in nutrient demand of young women when physiological and psychological demand is high. Uniquely formulated for women, this full spectrum formula of Food-Grown vitamins and minerals, wholefood nutrients and herbs provides support for the daily demands of life. Such demands include fluctuating hormone levels, menstruation, busy lifestyles and higher oxidative stress, whilst also supporting fertility preservation. Oxidative stress is a result of ‘free radical damage’ produced from lifestyle factors including stress, environmental pollutants, alcohol, cigarette smoke, poor diet and high levels of exercise. Wild Nutrition`s expertly formulated product has the extra benefit of alpha lipoic acid which contributes to the maintenance of normal blood cholesterol levels, as well as inositol, organic beetroot powder and ashwagandha. Vitamin C and Bioflavonoids incorporated in Citrus pulp; Mineral enhanced Yeast providing Thiamin, Riboflavin, Vitamin B6, Vitamin B12, Vitamin D3, Niacin, Panthotenic Acid, Biotin, Vitamin E, Choline, Inositol, GTF Chromium and Potassium; Lactobacillus bulgaricus* (from milk) combined with Iodine, Iron, Magnesium, Molybdenum, Selenium, Zinc, Copper, Manganese and Calcium; Folic Acid and Vitamin K incorporated in Alfalfa concentrate; Beta-Carotene incorporated in Carrot concentrate; Alpha Lipoic Acid, Ashwagandha powder and Organic Beetroot powder. Vegetable Cellulose (capsule shell). Free from: Wheat, soya, gluten-containing ingredients, artificial colours, added sugars, flavourings & preservatives. This product is free of excipients. Contains no live yeast at time of manufacture. Take 2 vegicaps per day with food. Below are reviews of Wild Nutrition Daily Multi Nutrient - Women - 60 Capsules by bodykind customers. If you have tried this product we'd love to hear what you think so please leave a review.